RIPNET Review 2019: Is RIPNET a Good Hosting? 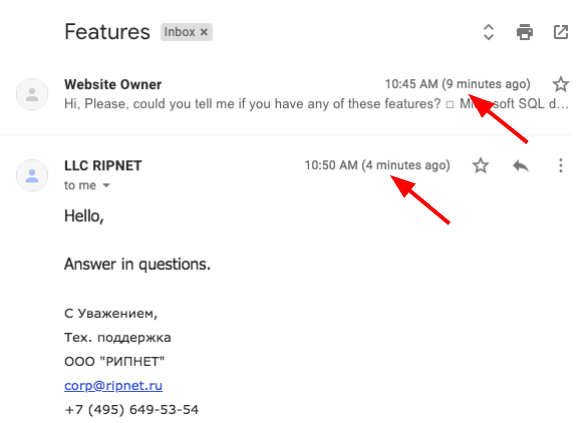 RIPNET is a long-standing Russian hosting provider. It offers excellent customer service, well-priced plans, and substantial features - if you don’t mind older versions of certain software. RIPNET or “Russian Internet Provider” was founded in 2005 and has been providing Russian website hosting ever since. It uses a Tier III data center and its website is available in Russian and English. It calls itself a large and reliable provider of the Russian Federation, however, it’s not clear from the website how many customers it has. 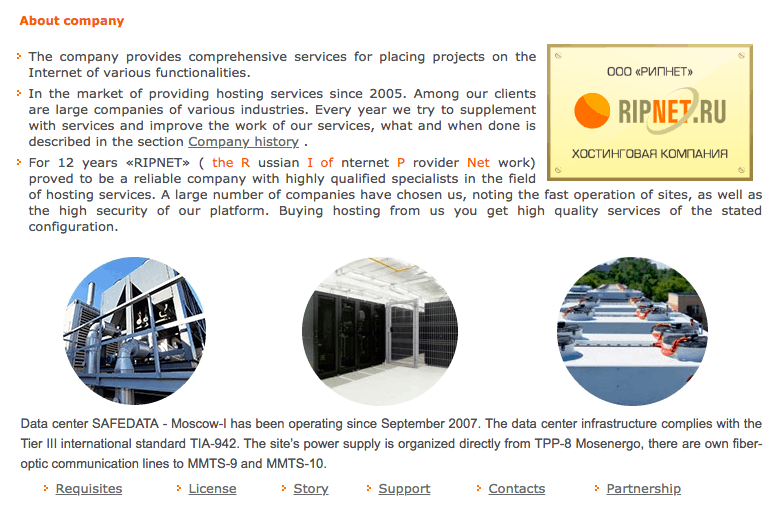 RIPNET uses a Moscow-based data center, SAFEDATA. The center is Tier III, which means you should experience less than 1.6 hours of downtime per year, however, make sure to note, there isn’t an uptime SLA displayed on the website. Backups are configured to run automatically on a weekly basis, but you are allowed to configure more frequent schedules if that’s important to you. It’s also a little disappointing that only version 5 of PHP is supported and not the twice as fast version, 7. Aside from that, the support for experts is quite good. You can schedule Cron jobs to keep your site running smoothly, you are allowed SSH access, and Python is supported in all of the shared hosting plans. There’s even a bonus Cloudflare CDN included. There’s a website building tool, which you can demo before you buy a hosting plan. Granted, it doesn’t have the best interface, but it is free with all plans. Plus, more than 200 popular programs such as WordPress, Joomla!, and Drupal are included in the control panel. The plans are well-priced, especially when you consider the value-added features for both beginners and experts. The plans can be purchased in one, three, six, and twelve-month terms. As well as a discount on the monthly price when you pay for a longer term upfront, in annual plans you also get a free domain name. There isn’t a money-back guarantee, but if you cancel, you get a prorated refund for any unused time, which is unusually generous. If you need customer service, it’s available via help documents and FAQs, as well as telephone, tickets, and emails. Confusingly, in order to ask pre-sales questions, you are directed to login to submit a ticket! I managed to find an email address, which was hidden on the website and directed my questions to it. I got a reply, within minutes of sending my original email. The operator was friendly, polite, and answered (nearly) all of my questions in full. I say nearly because I asked whether there was an uptime guarantee and they answered “yes” but didn’t tell me the uptime percentage. Founded in 2005, you can see from RIPNET’s history that it has continued to evolve and add new features each year. The plans include a decent amount of features for beginners and experts for a good price, it’s just a shame it only supports PHP version 5. Wondering how RIPNET stacks up against other Web Hosting companies? Enter any other Web Hosting company and we will give you a side-by-side comparison.